This dynamic Breitling Navitimer Navitmer Chrono Heritage sports watch fascinates athletes or simply sports enthusiasts alike. 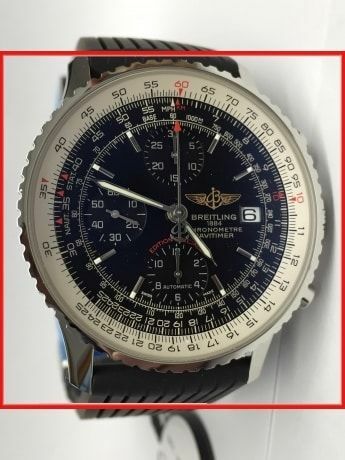 The Breitling Navitimer Navitmer Chrono Heritage sports watch is characterized by its dynamic design, robustness and functionality which athletes but also leisure athletes expect and seek. The dial of this very sporty watch is Color black, Hands 18 ct white gold and the bezel is Slide rules. The sports watch comes with a 25 jewels, Power reserve 42 hour, Half-oscillations A/h 28800, Mechanical movement self winding, Breitling cal. 13 movement. The Rubber bracelet is designed for sporting activity and durability. The functions of this sports watch include Chronograph, Date, Hour minute. Find more sport watches in our category of sportive watches. The sports watch has the product status New and is instock. If you order this copy, the watch is delivered with Original Box and with Original Papers. Of course, all our new watches come with the corresponding manufacturer warranty. Take a closer look at our Breitling luxury sports watches. You will quickly see why it is one of the bestsellers in our extensive range of luxury watches. Discover the world of Breitling watches and learn more about Breitling on the Manufaktur Webseite. Take a look at our other exclusive luxury watches and see why Breitling and other watch brands are so seductive. Rattapante is a leader in the online luxury watch market. From new, unused to used watches, we offer only the highest quality watches, including the Breitling Navitimer Navitmer Chrono Heritage. Let one of our enthusiastic watch consultants help you to find the right luxury watch for your lifestyle.We will gladly take care of all the details during the purchase process and offer you first-class conditions at all times.